The Oreo Dory or Allocyttus niger is quite the odd looking fish. As you can see from the picture above, this fish has huge eyes that almost dwarf the rest of its body. The Oreo Dory is a relatively small saltwater fish that only grows to about 1-1/2' long even though it can live up to 100 years old! 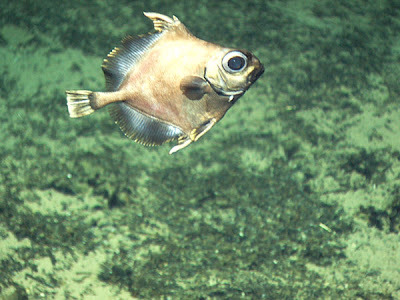 This strange deep sea fish is found at depths exceeding 3000'! They are said to lay 60,000 eggs which float up to the surface and hatch. The Oreo Dory is edible and is quite popular in places like New Zealand and Australia. They feed mainly on salps and benthic crustaceans. This fish is also known as the False Boarfish, Black Oreo or Spiky Dory.